Freelancing might seem the perfect fit for new parents. After all, a freelance career can be created from home, where you’ll also get more time to be with your child. This is an obvious benefit among many, but there are also a number of drawbacks. A freelance business takes a lot of time and effort. Just like raising a child does. When combining the two, it can be very difficult to juggle both responsibilities, and when things go wrong, it’s always work that comes off second best. If you’re relying on your freelancing to pay the bills, then you really need to find ways to get work done in what little time you may have. Many thousands of work-from-home parents do run successful freelance businesses while bringing up little children. You can too. With some careful planning, habit modifications, and by using the right tools, you can ensure you have plenty of time with your children while also meeting your income targets. As a freelancer, you have more flexibility to work around the needs of your children. However, it’s also important to set relatively strict schedules to follow. When you have a plan of action it’s easier to stay on course and focus your mind on what needs to be done. All parents and children have different routines. Your work time will depend on such factors as when your children are at kindergarten or when they usually nap, or a whole host of other scenarios. When you know, for example, you have a two-hour zone of work time each afternoon, then that time needs to be filled with client project tasks. Planning out your time ensures you can meet deadlines and select the right number of projects based on the amount of work time you have each week. To help you schedule your time, you can use a Kanban board. This provides a bird’s eye view of every task you need to complete and when. Each task is assigned a card, which can then be moved around or marked as completed, depending on your current progress. The visual nature of the Kanban board helps you spot any fast approaching deadlines or rearranged small tasks which you might miss with a traditional to-do list. Kanban boards also help parents fill in those many little pockets of time between parental duties and self-care. A 15minute window while your child naps can be used to complete a billable work task for a client. These many little pockets of time throughout the day, whether 5 minutes or 30 minutes, all add up. By making good use of these free moments, you can wrestle back an hour over a day or many hours over a week. Small chunks of work time also make seemingly overwhelming projects feel more achievable. As each task is completed, the bigger project soon becomes less intimidating. You also get an amazing sense of accomplishment by simply aiming to complete a small task in the amount of time you realistically have. Managing multiple tasks becomes that little bit easier. Time-tracking tools, along with the aforementioned Kanban boards, can really help you here. When you time eachtask and project, you get a better idea of how long similar tasks will take you in the future. This then allows you to better plan schedules and accept more suitable projects, which in turn speed up your workflow. Many people don’t really understand the nature of freelancing. This is made even more inconceivable for some when you’re also looking after children. It’s very easy for well-intentioned people to assume you’re free to chat or drop by for a coffee at the drop of a hat, just because you work from home. However, as you already know, freelancing is a serious business and child care is even more so. When you have schedules to follow, pockets of time to fill with billable work, and deadlines to meet, any distractions can throw the rest of your week into chaos. It’s for this reason, it’s important to set boundaries with family and friends. Social time is vital, both for your mental health and the for the social development of your child, but it’s best these are planned in advance. Work time should be separated from social and leisure activities. People need to understand you’re a busy working parent and although you might be at home, you’re still on the clock. Every minute counts as a freelancer and parent. Clients rely on you to meet deadlines and deliver good quality work. Your children demand and need your attention, affection, and care. Both parties need to be fulfilled and it’s your job to get things done. This is why streamlining your processes and actions is important. Today there are many online apps, tools, and platforms which allow you to automate different features of your freelancing business. 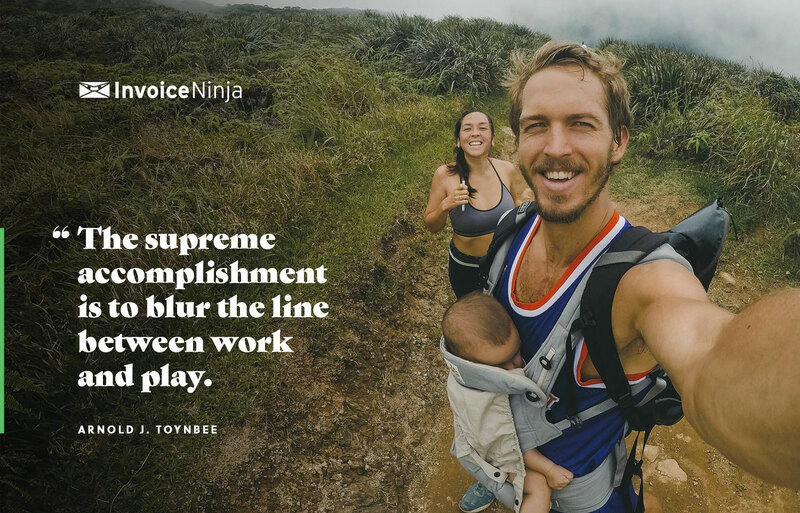 For example, at Invoice Ninja, many of your invoicing procedures can be automated such as late payment reminders and recurring billing for clients on retainer. Data synchronization can also help you to keep multiple different apps updated with the same information, without needing to enter data into each one individually. This means you can take your work anywhere, such as when waiting for your child to finish swimming class, and still have all the data you need to spend a few minutes working. We have connected with thousands of different apps, allowing you to use Invoice Ninja in conjunction with a whole array of different platforms. You can also sync your data across many different devices as well as automate manytasks which would otherwise eat into your family time. These tools and systems can boost your productivity and vastly improve your cash flow. When you’re stressed, tired, desperate for a nap, and worried about meeting deadlines, then the wonders of modern technology and integrated systems can really reduce the pressures you face as a busy freelancing parent. Plus, with Invoice Ninja, invoicing itself is a breeze. We’ve developed a system where you can create, send, and track invoices with a few simple clicks of a button. All your financial data is laid out clearly in your account. What’s more, all payment options are made very easy for your clients, meaning you get paid quickly and smoothly.